Epiphone’s new Ltd. Ed. ES-339 P-90 PRO is a modern guitar with roots firmly planted in Epiphone’s classic era when Epi’s famed Kalamazoo factory produced rock’s most legendary instruments in the late 50s and 60s. Featuring a reduced size ES-style body and Epiphone’s new P-90R PRO™ “soapbar” pickups, the new ES-339 P-90 PRO semi-hollowbody turns back the clock while breaking new ground in sound and style. First introduced in the late ’50s, the original ES series became an instant rock classic that brought the feel and look of an archtop to a generation of players who had grown up playing solid body guitars like the Les Paul. But for some, ES-style archtops felt too bulky to play on stage or in the studio. Now, the new ES-339 P-90 PRO is the perfect remedy featuring smaller body dimensions while still retaining the bell-like tone the ES series is famous for. And just like Epi’s nouveau classic ProBucker™ humbuckers, the new P-90 PRO™ “soapbar” pickups are a stunning recreation of the first generation of handwound P-90s which many consider the best single coil pickup ever made. Like every Epiphone, the new Ltd. Ed. 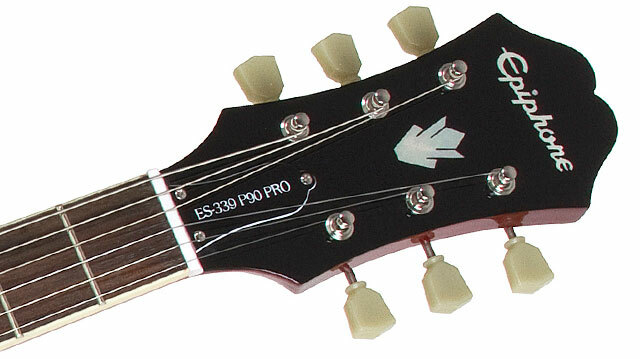 ES-339 P-90 PRO features a Limited Lifetime Warranty backed by world famous 24/7/365 Gibson Customer Service. Visit your Authorized Epiphone Dealer and discover why Epiphone is make the modern era the best era yet to buy a new guitar with the Ltd. Ed. ES-339 P-90 PRO. he Epiphone Ltd. Ed. ES-339 P-90 PRO features a reduced size laminated maple body with a solid center block like original ES-style classics and a black pickguard with metal “E” insignia. The mahogany SlimTaper™ “D” profile 24.75” scale neck has 22 medium jumbo frets and is hand-set and glued with a mortise and tenon neck joint with Titebond™ glue. The 12” radius neck features pearloid inlays and a 1.68” nut. 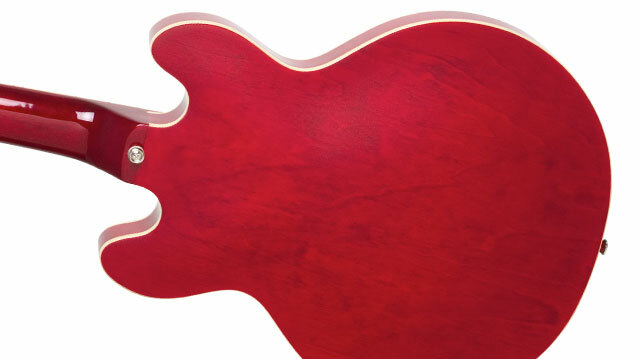 Single-ply cream binding on the fingerboard and body completes the classic look. The Ltd. Ed. ES-339 P-90 PRO comes in six beautiful color finishes: Cherry, Ebony, Natural, Pelham Blue, Vintage Sunburst, Wine Red. The Ltd. Ed. ES-339 P-90 PRO features Epiphone’s new P-90R PRO™ “soapbar” pickup, a true recreation of the first generation of P-90 pickups found in Les Pauls. 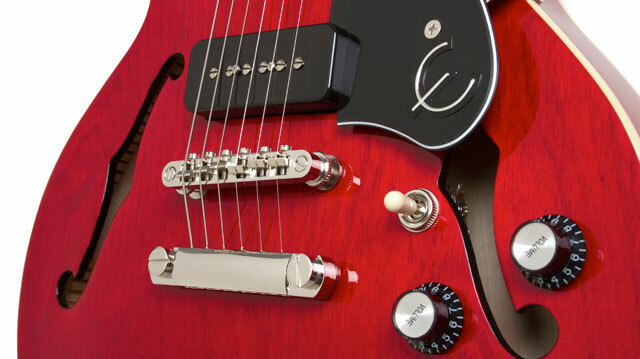 Epiphone P-90R PRO™ single coil pickups are individually voiced for rhythm and lead and provide a huge variety of sound choices for the modern guitarist. For those used to carrying two or three guitars to get all their favorite sounds, the new Ltd. Ed. ES-339 P-90 may be all you’ll ever need to take to a gig from now on. Epiphone’s guaranteed electronics also include standard controls for each pickup’s volume and tone with smooth black tophats with metal inserts, a tough 3-way toggle switch, and an all-metal heavy duty Epiphone 1/4” output jack that gives you a lifetime of worry-free use. The Ltd. Ed. ES-339 P-90 PRO features rock-solid hardware including Epiphone’s LockTone™ Tune-o-matic bridge and Stopbar tailpiece along with “Deluxe” tuners with tulip style buttons.